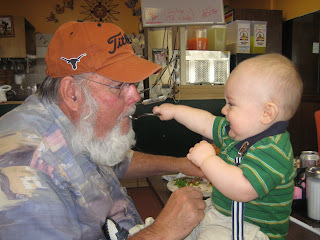 Life, DLG style: Barbacoa for babies??? While we were visiting for Easter weekend, we also celebrated Pop's birthday! 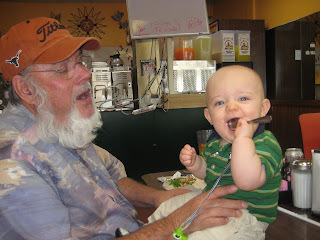 On Friday, we went to one of his favorite "hole in the wall" places for breakfast. Jon David gummed tortilla chips, ate guacamole, tried barbacoa, spit out a piece of corn tortilla and threw tripas on the floor! 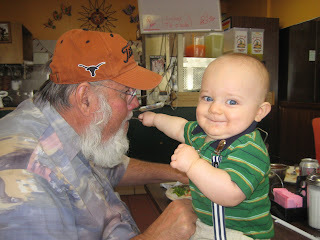 Pop was so pleased with his grandson and said frijoles (beans) are next!